A South Korean woman weeps, holding a portrait of her son killed aboard the Cheonan, during a funeral ceremony in Daejeon on April 29, 2010. 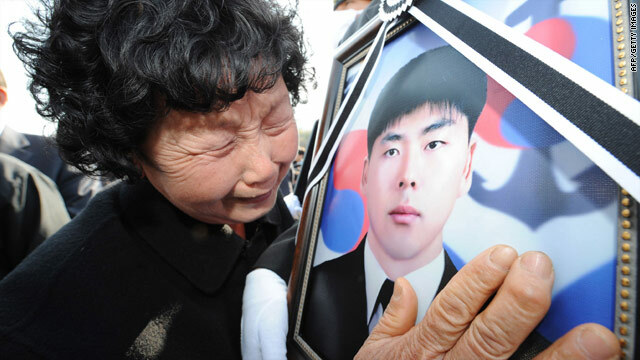 Mother of lost sailor: "I hope the nation will not forget my son, who did his duty"
Seoul, Korea (CNN) -- Lee In-ok will never forget Friday, March 26. It was late that night that the 48-year-old heard news that the South Korean warship the Cheonan was sinking in the frigid waters of the Yellow Sea off North Korea. "I called the naval camp, then I drove to the camp and my wife started crying," said Lee whose 22-year-old son was a crew member aboard the corvette. "At 7:00 a.m., they said 58 men had survived, but 46 were lost at sea. I was devastated, but hoped that my son would be saved." It was not to be. Petty Officer Second Class Lee Yong-san was one of the 46 sailors who would never return from the Cheonan's last patrol. As South Korea digests Thursday's official report accusing North Korea of attacking the vessel, the families of the 46 sailors who went down with her are left rebuilding their lives. Five bereaved family members met with a reporter in central Seoul early this week. They seemed emotionally drained but directed no apparent anger at North Korea. "I am not thinking of who did it, or why they did it," said Nam Gi-min, 33, brother of Master Chief Petty Officer Nam Gi-hoon, 36. "This tragedy happened to a family. My brother had three children; we are trying to work out how they are going to live. After time passes, we will think about whatever caused it." Snow was falling the night that the 1,200-ton ship went down near the flashpoint island of Baengnyeong; it is the northwestern-most territory of South Korea and lies within artillery range of the North. News broke almost immediately. "When I heard the news, I believed my husband was alive," said Lee Soo-jeong, 36, whose husband Kim Tae-seok, 36, was a master chief petty officer. "I was praying so hard, but I had no doubt that he was alive." "My brother was so strong, I knew he'd survive," said Nam. Park Hyeong-jun, 38, the brother-in-law of Chief Petty Officer Moon Gyu-seok, 36, traveled to Baengnyeong to witness an urgent rescue operation. "Conditions looked bad," he recalled. "The possibility of our family members remaining alive looked low." The navy was under intense public pressure to expedite the rescue. Some family members of the missing had stormed into Pyeongtaek naval base and assailed the Cheonan's captain, Choi Won-il. Media reported that the men trapped in underwater air pockets could survive 60-70 hours. Once the wreck was located, divers braved some of the world's strongest underwater currents and visibility of less than a meter. Normal safety rules and regulations were thrown out the window. On March 30, Chief Master Sergeant Han Joo-ho, 53, of the elite Ship Salvage Unit died while attempting to enter the hulk. It was then that the family members realized that it was unfair to risk further lives. "We thought we could not sacrifice any more, so we asked them to stop," Park said. "That was the toughest time, the hardest time, for all of us." Min "could not believe it" when he realized that his brother would not be coming to the surface. Rescue attempts were halted on April 3. Operations then moved into recovery mode. On April 15 the stern section -- where most of those killed were trapped -- was brought to the surface. Bodies were removed, one by one, from the salvaged section. Relatives were on hand to identify them. It was closure for some. On April 29, some 2,800 mourners, including President Lee Myung-bak, attended the dead sailors' memorial service and funeral. The Cheonan's dead today lie in the National Cemetery in the city of Daejeon, an hour south of Seoul. The bereaved are returning to the practicalities of day-to-day life without their loved ones. "I buried him in my heart," Lee Soo-jeong said of her husband. "Now I am thinking how I am going to survive. Can I do without him? Every day around 6:00 p.m., it feels like he is going to come in." The mother of three daughters, ages 6, 8, and 9, Lee said that even her eldest girl is still not really aware of what happened. "They don't know why he is away," she said. "They look at his photo and say, 'Daddy, I am going to kindergarten today.'" Flicking through a photo album, she showed pictures of her husband: Grinning at the camera; hugging his daughters under an autumnal tree; posing next to a gun turret aboard his doomed warship. "Every year on March 26 I will be visiting the National Cemetery with my daughters," she said. "I think my husband will be doing the same thing up above." Yet there is a quiet pride amid the sadness. "I hope the nation will not forget my son, who did his duty," said Lee In-ok. "I will try to live up to his name for the rest of my life."